We continue our Presidential Geography series, a one-by-one examination of each state’s political landscape and how it is changing. Here is Nevada, the Silver State. FiveThirtyEight spoke with Jon Ralston, a longtime political reporter in Nevada who runs his own political commentary site, RalstonReports.com, and hosts a public affairs program also called “Ralston Reports;” and David Damore, an associate professor of political science at University of Nevada, Las Vegas. With less than a week until Election Day, Nevada’s six electoral votes remain pivotal. After three days of campaigning were canceled so he could oversee the federal response to Hurricane Sandy, President Obama returned to the trail Thursday, including a stop in North Las Vegas in the afternoon. That was about the same time that Representative Paul D. Ryan spoke in Reno, Nev.
Nevada should be one of the more promising battleground states for the campaign of Mitt Romney and Mr. Ryan. The state’s economy is in disrepair. Its unemployment rate, 11.8 percent, is the worst in the nation, and personal bankruptcies and foreclosures have ravaged the state. In addition, although their effect can be overstated, Mormons make up 9 percent of Nevada’s population, tied for the third-largest share of members of the Church of Jesus Christ of Latter-day Saints. Mormon voters are expected to overwhelmingly support Mr. Romney, a Mormon himself. Nevada was once reliably red, favoring the Republican candidate relative to the national popular vote in every presidential election but one — 1960 — from 1948 through 2004. The Silver State’s rightward bent began to dissipate in the 1990s and 2000s. Bill Clinton, a Democrat, carried Nevada in 1992 and 1996, although he was helped by the independent candidacy of Ross Perot, Mr. Damore said. In 2004, Nevada was almost exactly at the national tipping point, only 0.13 percentage points more Republican-leaning than the nation. Then in 2008, Nevada made the switch. Mr. Obama won nationally by seven percentage points, and he carried the state by 12.5 points. For the first time since 1960, Nevada was more Democratic-leaning than the country. 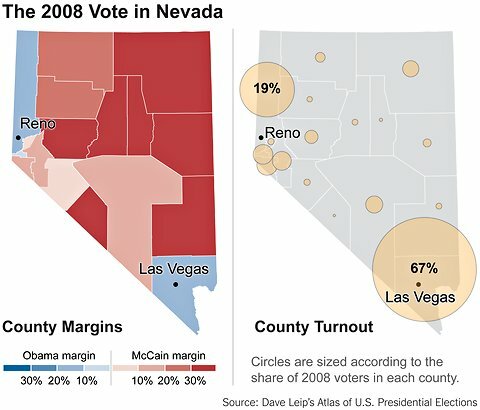 In 2010, Nevada showed signs that 2008 was not an anomaly. Harry Reid, the Senator majority leader who was battling a Republican wave nationally and poor approval ratings locally, upset expectations (and the polls) to defeat the Republican Sharron Angle in Nevada’s Senate race. Nevada’s leftward tilt is unlikely to be as strong in 2012 as it was in 2008, according to the FiveThirtyEight forecast. But the fact that Mr. Obama is favored at all is evidence of how thoroughly Nevada’s political landscape has been remade by the state’s fast-growing minority populations. Nevada led the nation in population growth for the past two decades, more than doubling in size to 2.7 million, from 1.2 million in 1990. 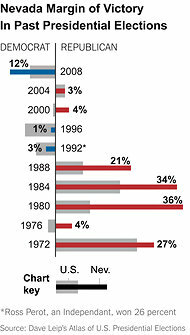 Fueling that growth has been Democratic-leaning demographic groups: Hispanics, Asians and African-Americans. While Nevada’s non-Hispanic white population grew by 12 percent from 2000 to 2010, African-Americans grew by 58 percent, Asians by 116 percent and Hispanics by 82 percent. Non-Hispanic whites are still a majority in Nevada, but barely, comprising 54 percent of the state. Hispanics are 27 percent, African-Americans are almost 9 percent, and Asians are about 8 percent. The state’s booming population has also made Nevada more urban, as the growth has been focused primarily in and around Las Vegas and Reno. Nevada is now the third most urban state in terms of population, according to the 2010 census. Rural Nevada — which has not seen the population boom that Las Vegas and Reno have — is still overwhelmingly Republican. But it accounts for only about 15 percent of the state population, Mr. Damore said. Clark County, where Las Vegas is located, is home to more than 70 percent of Nevadans. It is a majority minority county and a Democratic stronghold. The core of Las Vegas is the most left-leaning and predominantly Hispanic and African-American. The Las Vegas suburbs are more politically competitive, similar to suburban communities in Colorado or Virginia, Mr. Damore said. Democratic candidates in statewide races can count on carrying Clark County, but they want to win it by a wide margin to cancel out the G.O.P.’s advantage in rural Nevada, Mr. Ralston said. The vote in Washoe County, then, often decides the winner. vada as a whole. In 2004, it was one point more Republican, and in 2008 Mr. Obama carried Washoe County by just over 12 percentage points, matching the statewide vote almost exactly. To carry Nevada, Mr. Ralston said, Mr. Romney will almost certainly have to carry Washoe County. Mr. Obama needs only to keep it close there, as long as he performs strongly in Clark County. Mr. Obama is an 80 percent favorite in Nevada, according to the current FiveThirtyEight forecast. Mr. Romney could still win the state, but mostly in situations where he had already reached 270 electoral votes. Nevada’s growing diversity has made the state more politically competitive, but it does not tell the whole story. Arizona is almost a third Hispanic, but it is still reliably Republican. In Nevada, the fast-growing minority communities have been harnessed by top-notch turnout operations built by Mr. Reid and the 55,0000-member Culinary Union. Democrats have amassed a voter registration advantage of 130,000, and early voting in Nevada has so far favored the Democrats, according to an analysis by Mr.Ralston. At the same time, the state is led by a popular Republican, Gov. Brian Sandoval, who may provide a model for Republican success in the state, Mr. Ralston said. The gains Democrats have made in Nevada appear to be just strong enough to counteract the bad economy and Mr. Romney’s advantage among Mormons. Republicans generally and Mr. Romney specifically can still succeed in the Silver State — as Mr. Sandoval proves — but it’s tougher than it used to be.